The Trend Magic Indicator shows the direction of a trend and indicates when it changes. Blue dots in the chart indicate an uptrend, red dots indicate a downtrend. The indicator is the trigger for the Trend Magic Expert. The colors of the dots can be changed. This is a free version, it works in every chart. 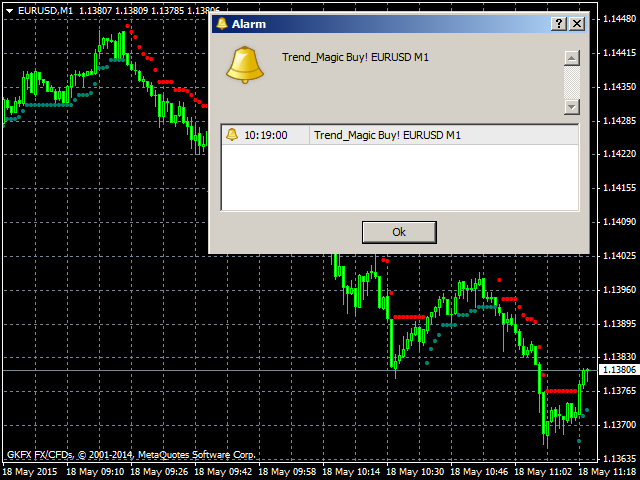 The paid version Trend Magic Alarm informs with a sound and a popup window when the trend direction changes, as shown in the picture below.